Agriculture could be preserved through integrating farming into our urban lifestyle. The planet is growing more food than ever, and yet millions of people continue to starve worldwide. People are hungry everywhere — in the country, in the suburbs. But increasingly, one of the front lines in the war against hunger is in cities. As urban populations grow, more people find themselves in food deserts, areas with “[l]imited access to supermarkets, supercenters, grocery stores, or other sources of healthy and affordable food,” according to a report by the U.S. Department of Agriculture. New technologies are changing the equation, allowing people to grow food in places where it was previously difficult or impossible, and in quantities akin to traditional farms. Urban farms can be as simple as traditional small outdoor community gardens, or as complex as indoor vertical farms in which farmers think about growing space in three-dimensional terms. These complex, futuristic farms can be configured in a number of ways, but most of them contain rows of racks lined with plants rooted in soil, nutrient-enriched water, or simply air. Each tier is equipped with UV lighting to mimic the effects of the sun. Unlike the unpredictable weather of outdoor farming, growing indoors allows farmers to tailor conditions to maximize growth. With the proper technology, farming can go anywhere. That’s what the new trend of urban farming shows — these farms go beyond simple community vegetable gardens to provide food to consumers in surrounding areas. All vertical farmers need is some space and access to electricity, no special facilities required. Farmers can buy everything they need to start and maintain their farms online as easily as shopping on Amazon. In fact, because it’s so easy to access starting materials, officials don’t really know how many urban farms are running in the United States. A 2013 survey by the National Center for Appropriate Technology (NCAT) received 315 responses from people operating facilities they describe as urban or suburban farms. However, federal grants for agriculture development show thousands of city-dwelling recipients, indicating that the number of urban farms is likely much higher. “You have to look at these facilities in cubic feet as opposed to square feet. 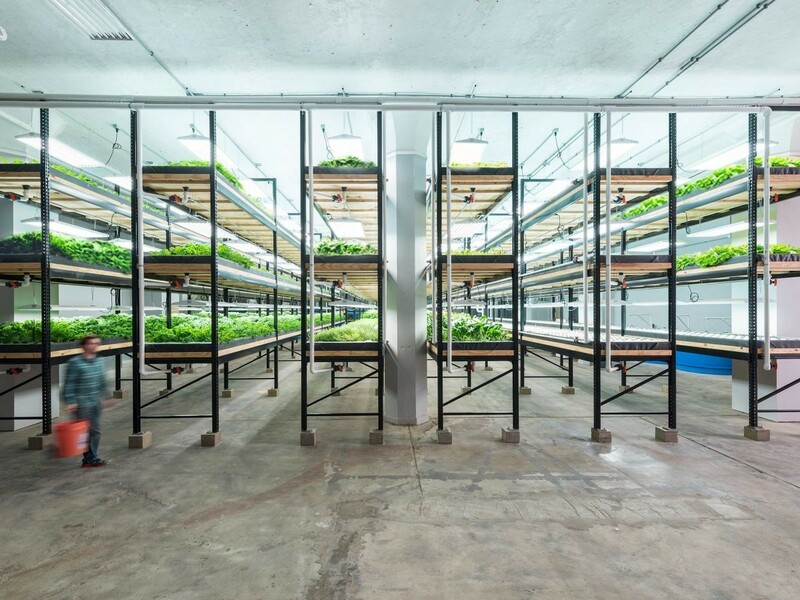 We can really put out a lot of produce from a facility like this,” Dave Haider, the president of Urban Organics, a company that operates urban farms based in St. Paul, Minnesota, told Futurism. Technology allows vertical farmers to control the environment in their farms, enabling them grow a lot more in the same amount of space, according to a 2014 study in the Journal of Agricultural Studies. Urban farms can grow more than just fruits and vegetables. Urban Organics grows three varieties of kale, two varieties of Swiss chard, Italian parsley, and cilantro, but uses the same water to raise Arctic char and Atlantic salmon — a closed-loop system often called aquaponics. Fish waste fertilizes the plants, which clean and filter the water before it goes back into the planters; excess drips into the fishtanks. Urban Organics opened its first farm inside a former brewery complex in 2014. In the years since, it’s brought food where it’s needed most: to people in the food deserts of the Twin Cities. In 2014, The Guardian named the company one of the ten most innovative urban farming projects in the world. “Trying to put a dent in the industry when it comes to food deserts is really one of the driving factors behind our first farm, which was actually located in a food desert,” Haider said. Urban Organics sells its produce to local retailers and provides locally-sourced fish to nearby restaurants. “That was sort of a sort of our approach — let’s try to grow produce and raise high-quality protein in an area that needs it most.” As more people move to cities, problems like food scarcity might get even worse. The vertical farm is also environmentally-friendly. Aquaponics systems result in very little waste. Vertical farming allows growers to use their finite area more efficiently, so we collectively can better utilize established space instead of creating more arable land, leaving more ecosystems intact. Placing the farms close to vendors and consumers means that fresher produce can reach tables with less reliance on trucks, which contribute to pollution and global warming. What’s the Harm in an Urban Farm? As people all over the world move to cities, urban centers sprawl to accommodate them. Often, that means taking over former farmland to support more people. In New Jersey, cities like Camden and Trenton are becoming more populous as they convert into urban spaces. Vertical farming can limit that sprawl. “Vertical farms can actually come into these areas to recolonize the city and to take spaces that have been removed from producing anything,” Paul P.G. 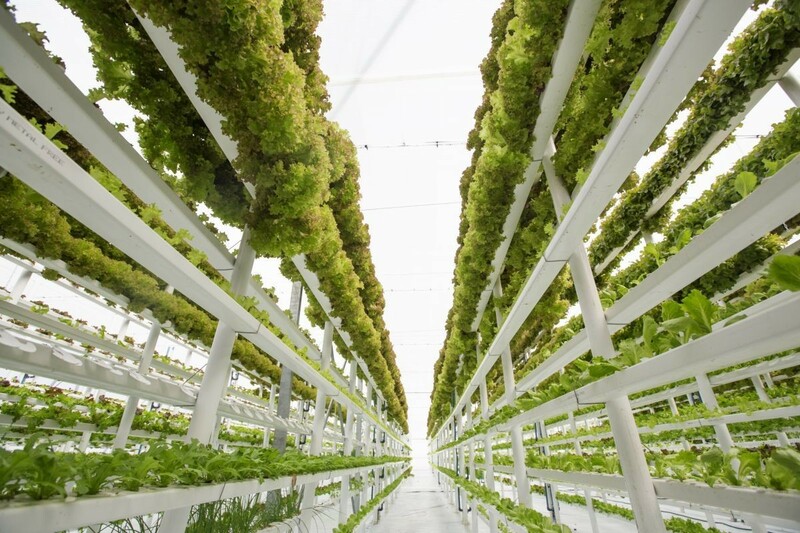 Gauthier, a vertical farming expert at the Princeton Environmental Institute, told Futurism. But setting up an urban farm is often not an easy task. Finding enough space for an affordable price can present a significant obstacle for potential farmers. Vertical farmers also need to know how to operate more technology, including systems that control elements such as soil contaminants and water availability, that nature takes care of on a traditional farm. Now, companies are popping up to help urban farmers get their facilities up and running. One Brooklyn-based company, Agritecture Consulting, helps people and organizations that want to start their own vertical farms to conduct market research and economic analyses, and to design and engineer the farm plans. The company has successfully completed more than a dozen projects to date, creating farms around the world, including some in the cramped confines of Manhattan and Brooklyn. The benefits of urban farming practices extend beyond the tangible aspects of growing food in underserved areas — there’s also a fortunate side effect of cultivating community. That’s a big draw for organizations, including Urban Organics and Agritecture Consultants. Urban Organics opened a new facility this past summer. It’s much larger than the organization’s other locations, and could provide more than 124,700 kilograms (about 275,000 pounds) of fresh fish and nearly 215,500 kilograms (more than 475,000 pounds) of produce to the nearby area each year. The former brewing complex in which the new farm is located is undergoing a revitalization, adding artists’ condos and even a food hall, according to a press release emailed to Futurism. Haider is excited about the potential of the new facility and the impact it will have on the developing neighborhood. “Not only are we creating some good-paying, quality jobs with some medical benefits, but these are jobs that just didn’t exist in the area prior to Urban Organics. And these are the things that excite us,” he said. This winning formula of bringing food and jobs to these areas can help build underserved communities. “Once that’s done, we get to go out to identify the next markets and then do it all over again,” Haider said. Empowering individuals to get into urban farming can build community, too. Henry Gordon-Smith, the co-founder and managing director of Agritecture, has a side project called Plus.farm, a do-it-yourself resource website for individuals and small groups looking to start urban farms of their own. It’s his passion project, his “labor of love,” he told Futurism. “This is my way of not-so-subtly democratizing some of the best practices. It’s a great way for people to create their own approaches, which is what I really want to see.” The site allows farmers to come up with their own hacks — better lights, better sensors, better growing techniques — and share them on the site’s forum. That’s how an ancient practice like farming continues to improve with modern tools. As people continue to study and tweak urban farming practices, we will continue to learn more about how they can benefit the areas surrounding them and the greater global community. Data on how urban farms directly affect their local communities may compel lawmakers to support and invest more in urban farms. Gordon-Smith has planned another side project to this effect: an entire building or neighborhood to test urban farming technologies while gathering data. Though the location has not yet been decided, Gordon-Smith has already received a $2 million commitment from Brooklyn borough president Eric L. Adams; he has also taken his proposal to the New York City Council. The proposal is waiting for consideration from the Committee on Land Use, and there is no indication of when it will be decided. Other efforts to combat world hunger grant people in poor nations more economic freedom by giving them lines of credit, or instituting basic income policies, like those being tested in Kenya. Education, social change, and female empowerment are all social initiatives that can help more people access the food they need to sustain themselves and their families. Urban farms have the potential to change the world’s agricultural landscape. Granted, we’re probably not going to see a planet of supercities in which all farming is done in high-rise buildings. But urban farms can bring greater yields in smaller areas, increase access to healthy options in urban food deserts, and mitigate the environmental impact of feeding the world. That seems like enough of a reason to continue to develop and expand these transformative farming practices.